I just found out today that Harris Teeter is the Official Grocery Store of the Washington Redskins. That carries a lot of weight with me, and I'll probably spend a lot more money there now that I know. I'd keep my eye out for some Washington Redskins shopping there, but I don't know what any of them look like. Maybe I'll just wait until I spot a really big guy shopping, and then follow him around to see what he picks up. And hope that he doesn't get pissed off and beat me to a pulp. 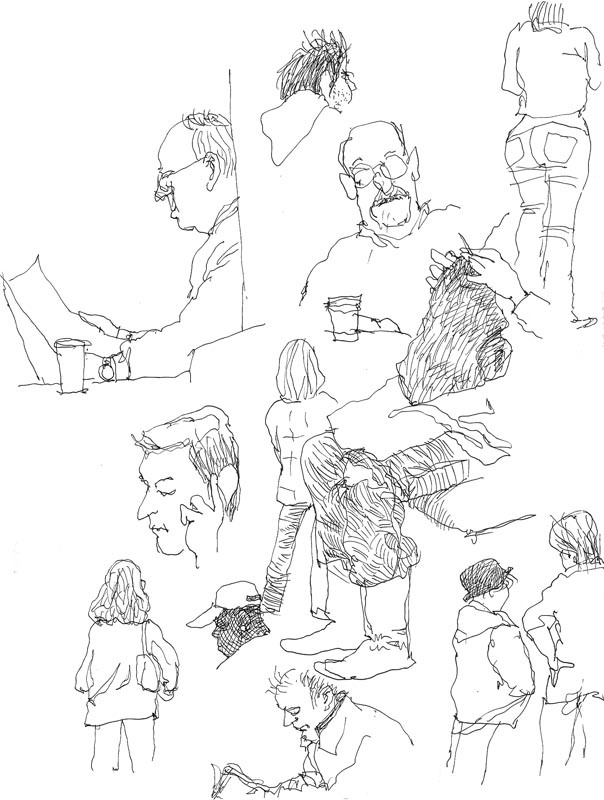 The really interesting person in this sketch, by the way, was a girl who was intently knitting something, and she had a big hole in the knee of her jeans. You know, like, irony? But she got up and left before I could get to her head, so I guess it doesn't count. December 2, 2006 by Walt Taylor.